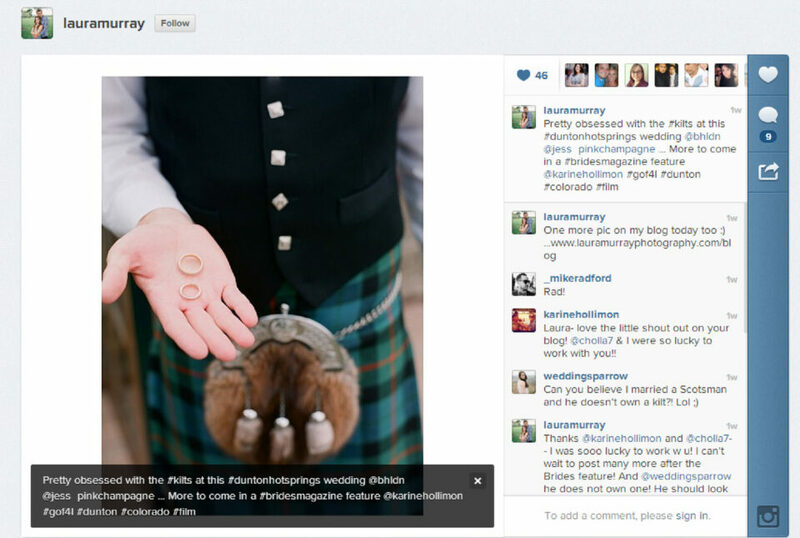 Instagram is my favorite social networking tool for my wedding photography business. If you are not utilizing it for business purposes, you are missing out on a wonderful opportunity. I often connect with wedding professionals on Instagram – wedding planners, florists, calligraphers, venues, dress shops, you name it! It has been wonderful for creating buzz and spreading the word about my business. 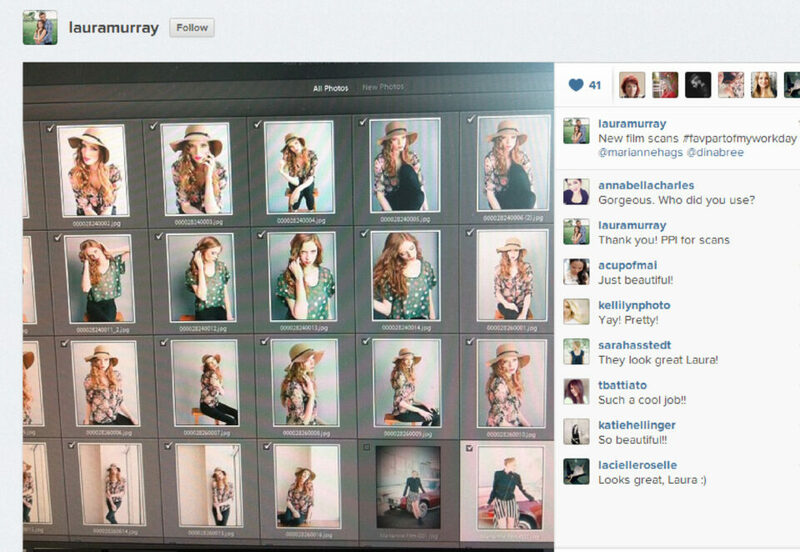 Below are some tips for getting the most out of your Instagram account. Provide content that is valuable to your readers. I love getting a little glimpse into the daily life of the creatives whose work I admire. But I tire very quickly of people who over-post irrelevant information. I post about 5 times/week as I don’t want to overload the feed of my readers. When you tag another user, it looks like this @lauramurray. When posting wedding images, I like to tag the bride and groom as well as all the vendors I worked with on a specific wedding. They are notified of my post, can view it, comment, and also share it themselves. 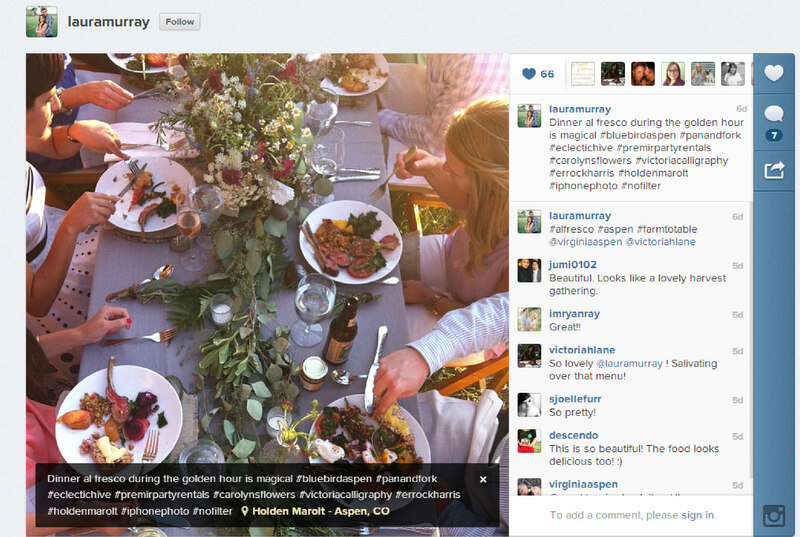 Hashtags look like this: #photographylife or #colorado. They are a great way for new followers to find you. Perhaps someone wants to find all the people who attended Elizabeth Messina’s ” A Lovely Workshop” (Elizabeth is one of my all time favorite wedding photographers). Type #alovelyworkshop into the explore page in Instagram and all the images where users who attended that workshop and added that hashtag will pop up. Or you can create an unique hashtag that is very specific to what you are posting. If you type in #sunset, you will see over 10 million posts. But if you want it to only be sunsets from you, create a specific and unique name like, #sunsetsfromlauramurrayphotography. The general rule is to use 1-5 hastags per post, although I do see people who use MANY more than that. You can see the most popular tags on Instagram here: https://web.stagram.com. People use hashtags for location, theme, and subject matter. Geotags link to the specific location of your Instagram post. Turn on the “add location” setting and Instagram will link to the location. Or if you posting after the fact, you can add the geotag yourself. The value to this is also allowing new followers to find you when they search for specific geographic locations. Connect with vendors you want to work with like florists, wedding planner, stylists, etc. Comment on their pics and start building relationships. Compliment them. There are several wedding professionals with whom I have a great working relationship and I met them initially on Instagram. Be genuine and get the dialog going. Since I am using my Instagram for business purposes, I want as many people to find it and to follow me. My account is public, meaning anyone can pull it up. There are a variety of privacy settings for Instagram, and for business purposes, I prefer the public setting. One tool that I have yet to utilize is hosting a contest on Instagram. But I HAVE entered many contests via Instagram. Create a content – give away something like a matted, signed print of your work or a book you found beneficial. 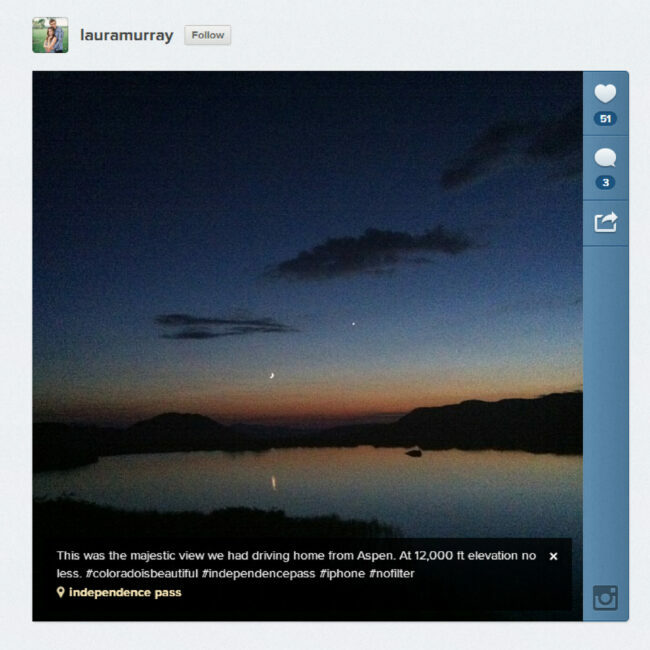 Post it to Instagram and have readers use a specific hashtag so you can track the entries. Set a duration for the contest, and at the end announce the winner. I would love for you all to follow me on Instragram. You can view my instagram account here. 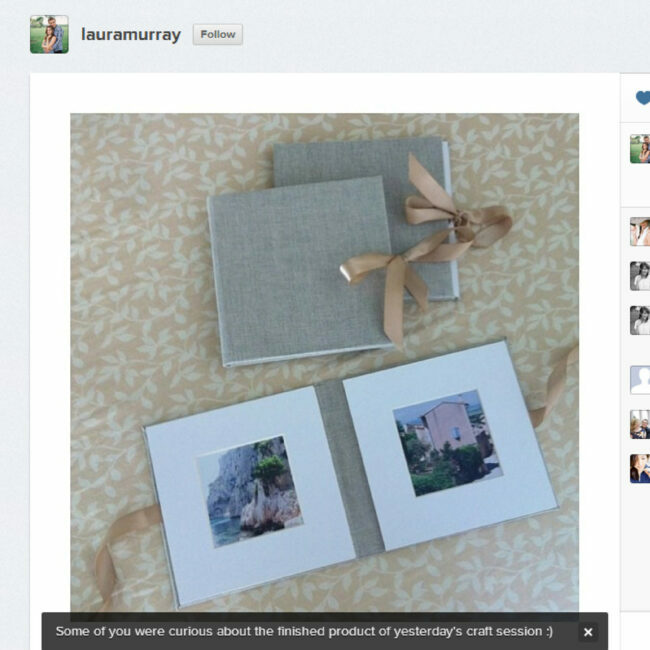 Or, you can look me up by my username of lauramurray. Laura, thanks for the article. I stay away from instagram and twitter – I often feel overwhelmed with the amount of information out there, and tell myself I don’t need to add to it :) but I do photography only part time and am often very busy (I only recently created a FB page and have been trying to post regularly). HOWEVER, if you are a full-time professional photographer, I think instagram and other social media are invaluable tools for exposure and networking – I totally agree with you! Especially for wedding photogs – you’re constantly networking with other vendors and reaching prospective clients.. and my guess would be that many of them are young people spending a lot of time on fb, instagram etc :) – p.s. love your work! 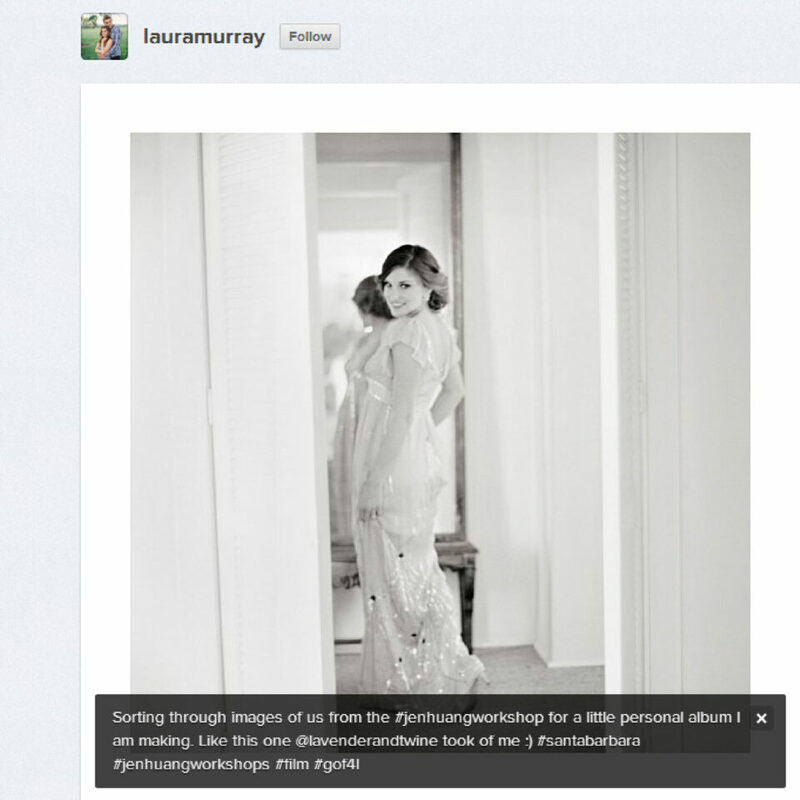 THanks Mikhail for the comment– I find Instagram to be the 2nd most helpful social network to be a part of. Facebook is definitely #1, but Instagram is a close #2. SOOO many good connections for me on there. I highly recommend checking it out! Hello, laura! I advise you nice tool www.push.photo/ It helps you with posting from you PC without any problems and also you can schedule it. And without downloading any app (really hate having millions of apps). I use it for more than a year and everything is fine! Thanks for this article. I just checked out your feed, too. I love the photos from your travels! I am considering Instagram but I don’t use a mobile phone to take photos. Do you post pics that you take with a DSLR or keep it to the iPhone? Thanks again. Some very sound tips Laura. I’m running an Instagram account for a music venue @islington_ah and it’s been really useful, for many of the reasons you mentioned. But in answer to Oriana’s question, most of our photos posted there are DSLR. It’s a common mistake to think that just because the photos are usually viewed on a mobile, they have to be taken on a mobile. The easiest, most convenient, and most budget-friendly way people will know of your business is through the use of the social networking sites. As advised by the photography blog, www.keepsake-images.net, social media are not going away anytime soon so as a photographer, you might really think of using them. You can advertise your photography business and entice people to consider you when they need to hire an event photographer. You will also get feedback and recommendations which would prove really useful. You can create some attractive advertisement and share it with friends and other people who follow you. It is so easy to spread a news using a social medium as a platform. 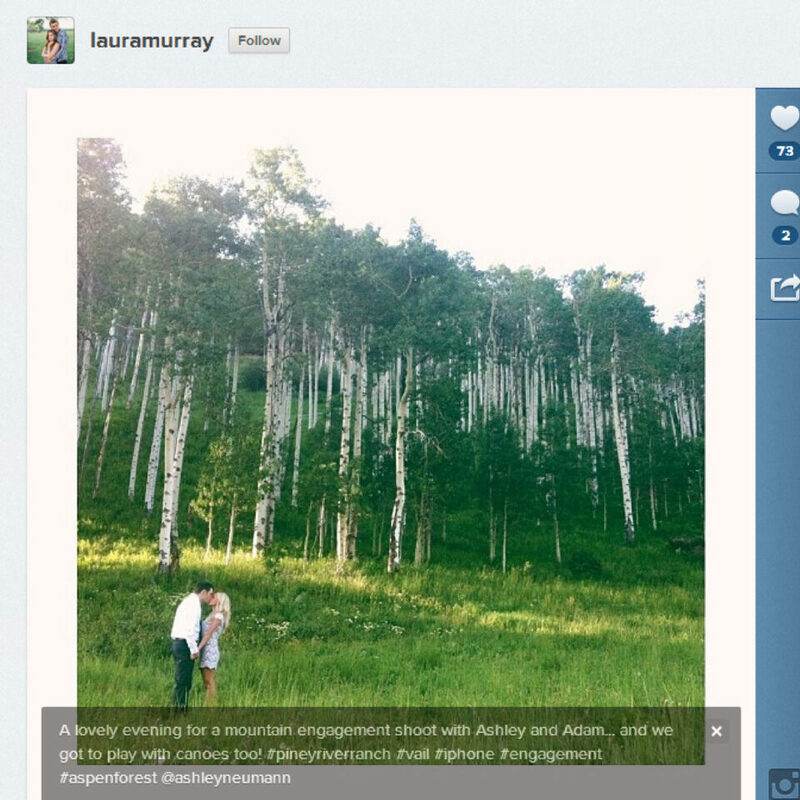 I am looking at branching out to including instagram in my social media. Can you tell me how you add it to your workflow…? I don’t have an I-phone and im finding it difficult to post my images from my phone, and instagram will not allow you to post from desktop. I need to do more with my Insta, I love looking through other feeds, but I could definitely do with spending more time on mine! Just followed you, great feed. I’m pretty regular on Facebook, but really going to make a goal for me to market more on Instagram. 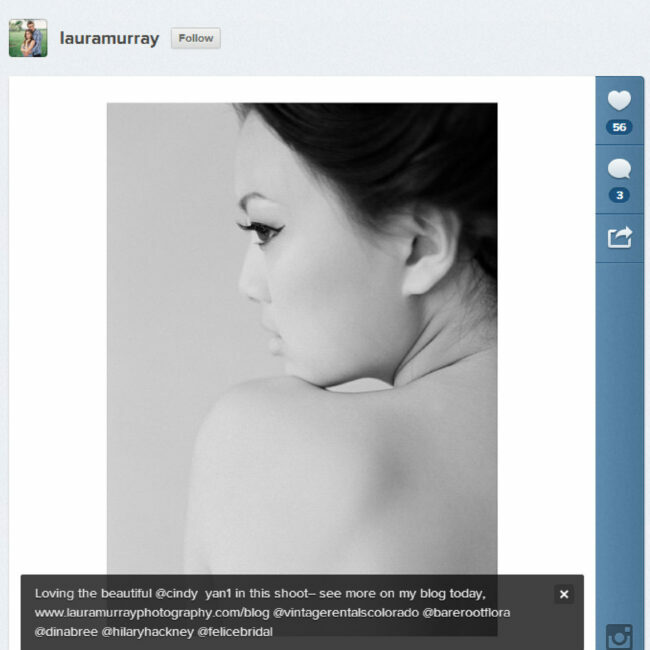 Hi Laura, I’m Thankful for finding you on Instagram. I checked out your page & your work & it’s amazing. I am a PT photographer. So my networking definitely needs HELP. I’m going to take your advice & try to network more on Instagram. My sister has a nice Cabin Rental Business & went to a seminar & they pretty much explained everything you have said here. So i’m going to put forth my effort I love what I do & want to do more & more. So a Great BIG Thanks to you for your much needed article.